Yum! I’m a fan of any kind of cheese dip in a crockpot. I make something similar but add a little milk, cheddar and monterey jack cheeses. Only because I’m a firm believer that the more cheese the better. 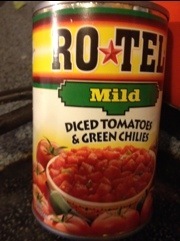 Strangely, I’ve never thought to add rotel. I certainly will next time!